Outagamie County was created in 1851 from Brown County. Outagamie is derived from the Chippewa word meaning either "dwellers of either shore" or "dwellers on the side of a stream." 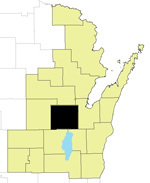 Located in northeast Wisconsin, the county seat is Appleton.